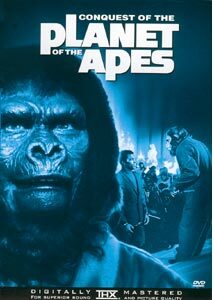 Conquest of the Planet of the Apes is by far the darkest installment of the series. From beginning to end there is no comic relief, no sense of playful wording or repartee. Whereas with each of the previous three films—in particular the third, Escape—there is little attempt to generate sympathy or empathy for the main ape characters (outside of their inhumane treatment, which reflecting back on how humans are treated in previous films warrants little). If there is a pure statement film in the series, this is it, and it is to this day still one of my favorites. My stepdaughter, Alex, who is watching these for the first time, assessed Conquest with a single word: "Scary." For those who have not experienced the series I will try not to give too much away of the plot and the particular connections, progressions from the previous three films. Suffice it to say that as with the Sarah Connor character in Terminator, there is an ape, named here Caesar (Roddy McDowall), that is destined to lead the revolt based on a very similar set of circumstances (any theories as to Cameron's source, conscious or not?!) Like those that came before him in the previous three films, this ape has the ability to speak and think rationally. Caesar, having been sheltered throughout most of its childhood, is brought to the city in 1991 by his friend and surrogate father, Armando (Ricardo Montalban) the circus master, in order to teach him the ways of the world. What Caesar learns is that in 1983 a mysterious virus was brought back from space by astronauts, killing all of the dogs and cats of the planet. Man, needing the company of pets, turned to primates. However, because they were so easily trainable, these pets soon became slaves. Apes once wild, are now domesticated—shining shoes, doing janitorial work, styling hair, fetching books in the library—albeit not without a few glitches here and there. The film moves from dark to darker as it progresses, from the brutal treatment at the hand of the police (or defense teams), suspiciously dressed like Gestapo, to the ultimate defiance and rebellion by the apes led by Caesar. The question here is about Mercy, as laid out mid-film (in the quote atop) by Caesar, as he is being electrocuted in order to force him to "speak." The villainous governor, Breck (Don Murray), suspects Caesar is "the" talking ape sought by the government after an altercation and ensuing beating of an ape (why does Rodney King leap to mind) in the Ape Maintenance complex that lead Caesar to shout out, "You human bastards,", reminiscent of Taylor's epithets in the first film. His inability to hold his tongue not only sets the wheels of destiny in motion, but also proves he is his mother's son. Spared execution because to MacDonald (Rhodes) Caesar is the embodiment of the slaves' struggle, despite the difference of species he identifies more with the apes' plight than the White run society. MacDonald perhaps—unfortunately—can be blamed for the downfall of mankind (or White mankind), as payment owed by the descendant of slaves himself. This may be the most fascinating aspect to the entire series. Really one of the very few light-hearted moments is here, with the protesting humans carrying placards denouncing the restaurant Armando and Caesar exit just prior to the altercation, bearing wonderful phrases such as "Unfair to waiters," Men not beasts," and "Slaves are scabs!" The culmination of the film in the Night of Fires, despite the reverse police Nazi-like imagery, strangely resembles Krystalnacht, the "Night of Fires" when Hitler's Brown Shirt thugs roamed through Germany smashing the windows of Jewish businesses, burning Jewish books and property. That is how dark this film turns. The only thing that the event here has over Nazi Germany is it stops short of a final solution, as a call for mercy is evoked. Image Transfer Review: This is a tough transfer to judge, mostly due its intended dark nature. While blacks seem true, as opposed to the other films so far in the series, this is the least impressive transfer (possibly due to source issues). On the one hand it is very dark, on the other, there are some daylight scenes that appear softer than any of the other transfers. Scan lines and graininess are more evident here, but fleshtones remain natural and consistent. Not at the superb level of the other transfers, but damn good nonetheless. Audio Transfer Review: It is interesting to witness the evolution of the music along with the series, as the film's musical score contains several passages heavily fortified by rock guitar riffs. Unfortunately, the rest of the audio imaging is not so interesting, in this rather dull and uneven mono mix. Most of the film is pushed through the center channel, as it is heavy in dialogue, but the moments of supreme violence are accentuated by both the eerie musical score and a rather vague, hollow sounding surround sound stage. Sound directionality is questionable, and many times it seems that bullets are coming from the wrong way. Disappointing compared to even the other mono and DS2.0 mixes in the set, let alone the DD5.1 from the first disc. Merely average. Extras Review: The supplements (or lack thereof) fall in line with disc 3, containing subtitling (below the image, in the lower black bar), available in English and French. Trailers for all 5 films are again present. Another short cast list is given. No photo gallery is provided. A weblink to Fox's website is given. While fans of the first three may not like this because of it's extremely dark nature, fans of the series understand the necessary progression. Although I miss the jovial nature and splendid repartee of the first films, to this day Conquest remains one of my favorites. I like its unrelenting darkness, and once again, despite Fox's effort to kill this series off by allowing dark, unhappy storylines that they thought would turn off audiences, it is this unflinching direction that makes the series so enduring, special and prominent among the great Science Fiction films of the Twentieth Century. This episode is not suitable for small children.